My legs ache. I am but a shadow of my usual hilarious energetic self (ahem.) 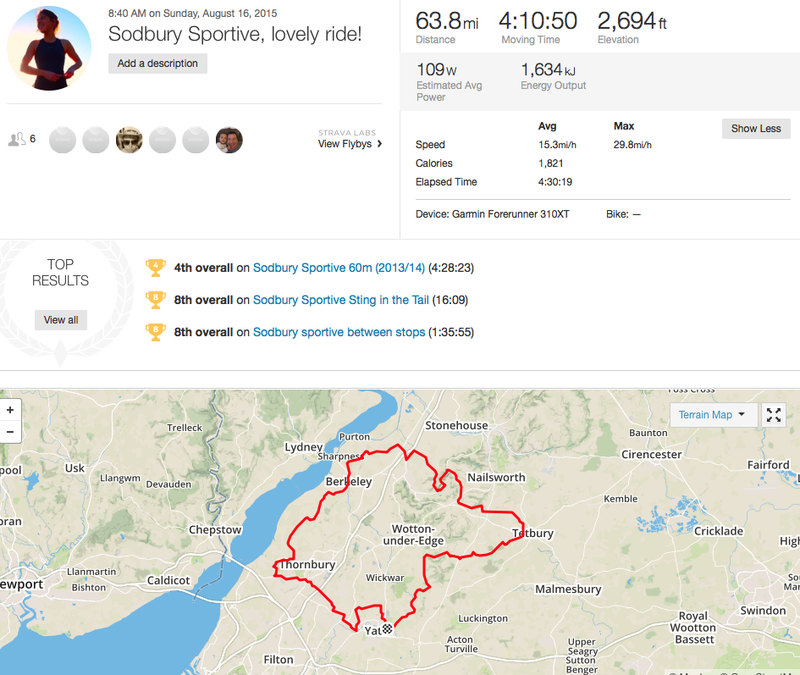 But I feel good, because I have just completed the Sodbury Sportive hilly 64 miler, on a beautiful life affirming english summer’s day, I even saw a bee, alas it thwacked my shades as I was traveling at 20MPH, I hope it was ok. Bzz. 8am this morn, bit chilly, awaiting our turn to get briefed. As we set off, I was concerned about how I was going to fare on this unbeknownst to me 64 miler (advertised as 60). my legs started to ache towards 20 miles, and I’d had a bad recovery run only yesterday, attempted 8 miles, started to walk at 7, everything felt very groany and slow, clearly not recovered yet. With Ironman only 4 weeks ago today, it’s possible that I was biting off more than I could chew this weekend with an 8 mile run and a hilly 64 mile ride. But I settled in, and the feed station at 24 miles provided a welcome cuppa and a marmite sandwich with ample butter on white bread. In ordinary circumstances this would be very wrong. Today, and in any cycle situation involving hills and many miles, it was very right indeed. Nom. I need not have worried. As per usual after a marmite sandwich I was good to go. And 12-15 MPH turned into 15-18 and beyond. We started to over take lots of men. And as we overtook more men, we enjoyed it and thus overtook more men. And more. And essentially were generally chicking men all over the Cotswolds by this point. Rosie and I had got into a rhythm, we were generally within a few meters of each other, freely whizzing down lush undulating descents, speeding tightly around little bushy car-free corners on country lanes. We had a one of those great rides, where everything just falls into place, and it feels easy to chat, and have spurts of speed, and as I may or may not have mentioned, overtake lots of men. Time for a nap. #thisgirlcanstilluseherlegsafterironman yippee. Afterwards with t-shirt bien sur.